We're all about Kyoto here at KyoTours Japan, but that doesn't mean we don't have other favorite spots all over Japan. Our Beyond Kyoto series of blogs is all about things to do and places to visit throughout Japan. Today, we'll fill you in on a few unique locations in Tokyo, the world's largest city and a must-see spot on any Japan vacation. Some of these places are well known, and some are off the beaten path, but we think they're all worth visiting! A bit of googling and online research can provide location info and visiting hours for all of these sightseeing spots. Enjoy! The Tokyo Skytree has been an eye-catching monument towering over the city since it opened in 2012. At 634 meters, the Skytree is the world's tallest tower and the second tallest structure after the Burj Khalifa in Dubai. Located right across the river from the busy Asakusa district, it's easy to access and a popular tourist destination. Because of it's popularity, many visitors write it off as simply a tourist trap that they can pass up. Don't make this mistake. If you visit on a clear day, the view is spectacular and well worth waiting in line for. Once you get up to the main observation deck at 350 meters, you can purchase tickets to go even higher up to the deck at 450 meters. If there's no line and the weather is clear, the second deck is a nice experience, but probably not waiting for. Lines can get long at peak seasons to enter the tower, but luckily a special ticket is available for foreign visitors that allows you to skip the wait and access the 350 meter deck in a special elevator. Be sure to bring your passport or foreign ID. 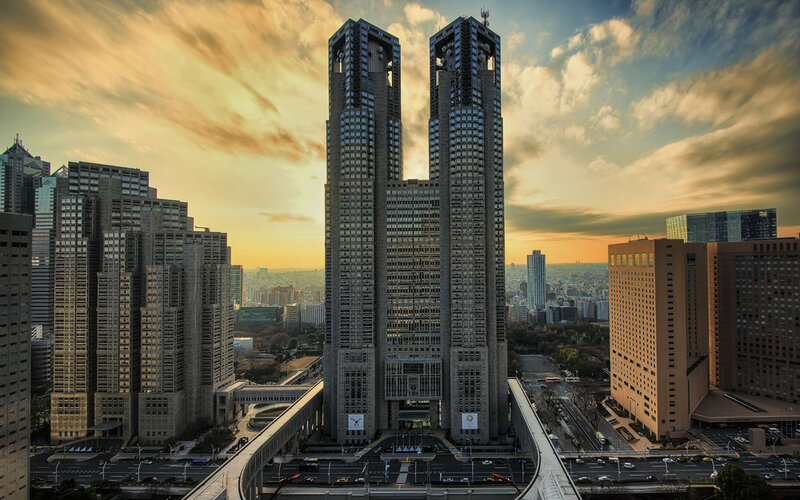 Another fantastic aerial view of Tokyo is found at the Metropolitan Building in the Shinjuku neighborhood. There are two observation decks in the twin towers of this city government headquarters, and they're both free to visit. Though not as high as Skytree, the Metropolitan Building is the best choice for a night view of the city. The north tower stays open until 10:30, and the nightscape of Tokyo from 45 stories up is a great sight. Entrance is in the basement level at nighttime, just follow the signs to the elevator and you'll find it eventually. If you're staying in Shinjuku, this is probably only a few minutes walk from your place! Better at night and less crowded. Fukagawa Fudo-do Temple is one of the best kept secrets in Tokyo. Located in an unassuming neighborhood, this temple was rebuilt after Tokyo was destroyed in WW2. With its modern boxy exterior covered in thick Sanskrit letters, it's unlike anything you'll see in an older city like Kyoto. The temple grounds house some impressive statues of Fudo Myo, a vicious guardian deity depicted clutching a golden sword and displaying a face twisted in gruesome determination. Since Fudo Myo is always shown surrounded by billowing flames, the ritual ceremony dedicated to him of course features lots of fire. This ceremony is often performed early in the morning at the break of dawn, but at Fukugawa Fudo-do, the priests gather for this ritual an astonishing five times a day. This should not be missed if you want to see something really special! During the 45 minute ceremony, a bonfire is built (indoors!) and fed small wooden sticks on which worshipers have written their prayers. Massive taiko drums accompany the chanting as the fire reaches the ceiling, creating a powerful music that you feel deep in your bones. Guests are seated on seats and stairs in front of the altar and are encouraged to chant along reading from printed cards distributed beforehand. At one point, people get up and form a line to hand over their belongings to the priest to bless in the fire. For whatever reason, most people choose to have their bags and purses blessed with a quick dip in the flames, but you can have anything blessed. (I saw a few cellphones and stuffed animals handed over last time I was there) If you want to stand back and just observe without chanting or getting somethign blessed, that's alright too. If the ceremony gets a little long for you, making a respectfully quiet exit is fine as well. Be sure to walk around the interior of the main building. When the fire ceremony isn't going on, head to a doorway on the left side of the altar and enter a long dark hallway lined with thousands of tiny glass statues of Fudo Myo. It's a really trippy experience and not what you'd expect to find in a Buddhist temple. Oh, and there's a room upstairs with neon dayglo Buddhas, shining sand, and black lights that is really a one of kind thing. As a whole, the temple manages to be both an inspiring and strange place at the same time. A must see if you enjoy unique hidden gems and good photo opportunities. Located within walking distance from the previously mentioned Fukagawa Fudo-do temple, Kiyosumi Teien Garden is a pleasant landscape surrounding a central lake. Despite being owned by a variety of businessmen and fuedal lords, the garden's current layout was finalized by the founder of the famous electronics company Mitsubishi and opened to the public in 1932. Not as large as some other Tokyo strolling gardens, the pathway around the lake offers excellent views of the water and takes you over some precarious stepping stones and bridges made from massive rock slabs. I was particularly impressed with the large amount of animals living in this park, a great mixture of turtles, birds, and fish. Kiyosumi manages to remain one of the more quieter gardens in Tokyo. One of the most well known gardens in Tokyo is also one of the largest. Hama Rikyu Garden has been used over the centuries by feudal lords and nobility for a variety of activities. You can still see remnants of horse parade grounds and duck hunting equipment, but it's the fantastic contrast of modern skyscrapers against the garden's greenery that make this place special. The contrast is especially striking when the flower fields are in bloom near the main entrance gate. With a wide flat lake and expansive grass dotted with carefully trimmed pine trees, the broad open spaces felt liberating after spending a day in crowded Tokyo. I'm not completely convinced that this garden with worth going out of the way to visit on its own, but luckily it's located right next to Tsukiji fish market (at least until it moves to its new location eventually). A walk over to see Hama Rikyu after a sushi breakfast at Tsukuji is a necessity when you're in this part of town. If you happen to be staying in one of the overlooking hotels, you're in for a great view. In my opinion, the best natural landscape in Tokyo is the massive Rikugien Garden. Within the walls of this nature preserve are 88 special pieces of scenery created by gardeners to evoke 88 specific famous lines of poetry. You can easily spend a few hours here exploring the various sidepaths through forested hills and glens. The pond in the center is small compared to the overall size of the garden, but feels totally different when viewed from varying angles. Climb up to the top of the hill overlooking the water for a unique view of the peaceful garden. My favorite section is set back in a shady corner of the grounds to the south where a waterfall scene scattered is given a sense of motion with stones twisted into unique shapes by flowing water. There's even a small teahouse near a rustic wooden bridge where you can stop for tea and snacks overlooking the water. Rikugien is by fast the standout garden in Tokyo for its wonderful attention to design detail that lets you appreciate the garden both as a whole and as individual landscape pieces. The Sumida Hokusai Museum is the latest addition to Tokyo's flourishing museum scene. This futuristic building is dedicated solely to Hokusai, one of the stars of Edo-era ukiyoe printing. Between the permanent collection set in a sci-fi inspired starfield room and the rotating exhibits in other galleries, there is a lot to take in here. There's plenty of English here, so it can be a very in depth educational experience if you are really into this unique art form. The lighting could be a little brighter to better see the details in the artwork, but the collection here is almost overwhelming and there is very little complain about. Get here early because the museum is small and very popular. Despite its smaller collection on display and uninspiring architecture, the Ota Memorial Museum of Art is my preferred spot to see ukiyoe pieces. Well-displayed and not as busy as the Hokusai Msueum, the artwork here speaks for itself. Unless you specifically want to see Hokusai's work, the Ota Museum is a better choice for those who want to be wowed by the most impressive ukiyoe prints on display in Tokyo. The collection is rotated monthly, so you never know what themed exhibit you'll be treated to. Located in Harajuku, this museum is a perfect addition when visiting quiet Meiji Jingu Shrine or the bustling fashion mecca of Takeshita Dori shopping street. Have a favorite Tokyo spot that we didn't mention? Contact us and let us know!